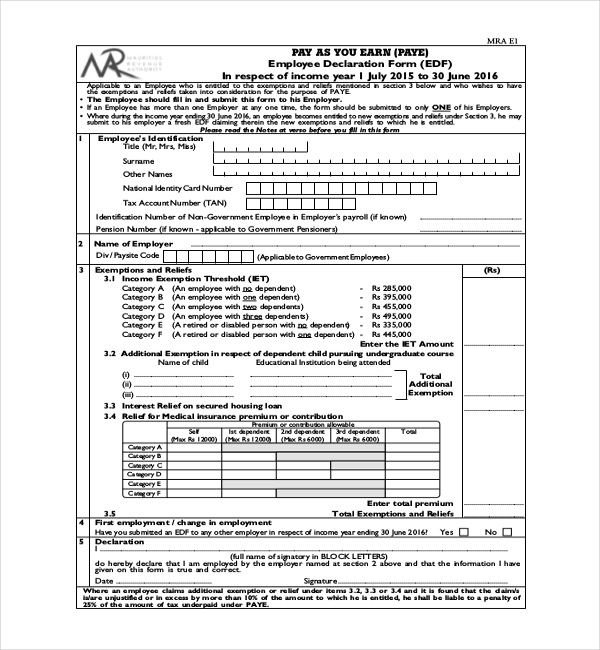 Employee Tax Declaration Form Template You may find tax declaration forms that require the employee details. The details like the name, work, job position, social security number and other details about salary must be filled. These forms are important to fill according to the law and not doing so can be questioned and the employee can get behind the bars to, if needed. Pay as you earn a kind of tax exemption for employees. It is a relief from paying taxes as of now but the taxes that are withheld is taken as advance payment of tax. This form requires the employee’s identification, exemption and reliefs to be filled as needed. The forms need to be submitted to the employer duly. 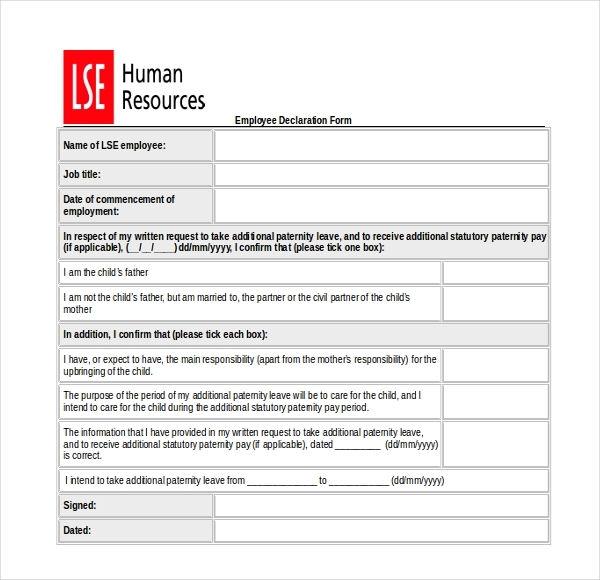 Those working for LSE would have to fill this form. The forms require parent’s information and to declare that all the information given is true to nature. The human resource department would preserve this form for their record. This form is for maternity or paternity leave. 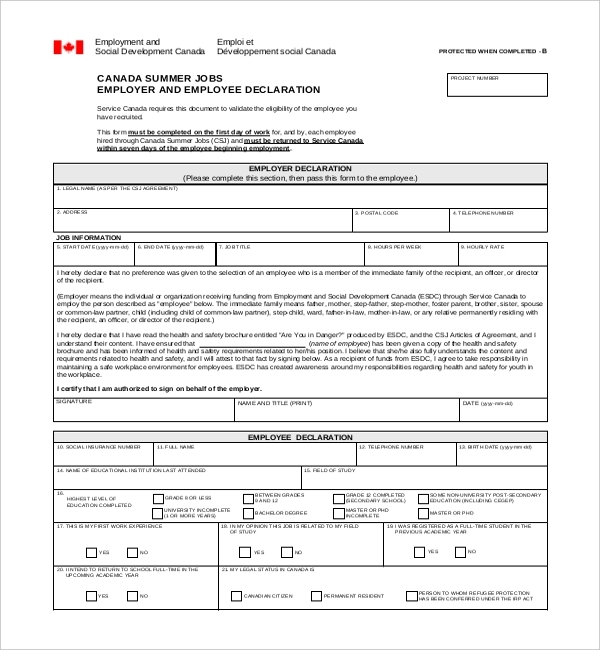 Canada summer jobs under the Government of Canada issues a form that has to be submitted in the allotted time. This is required to validate the employee’s eligibility that the Canada Services has hired. The forms must be filled in the first day of work and submitted within seven days from when you started work to avoid further delay. This tax code declaration forms are for employees who have to fill their tax code, entitlement of work and sign the declaration form to submit it to the employer. You will have to choose a tax code according to your income. The guidelines are given in this form for you to understand which code to use. 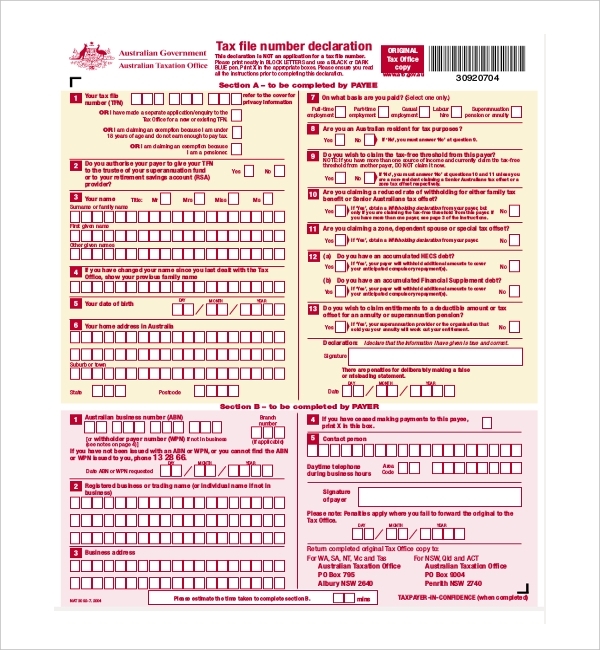 This form must be used when you start receiving payments from a new company/business/payer or circumstances changed. The forms provide you with the information about the amount of tax to be withheld from payments made. 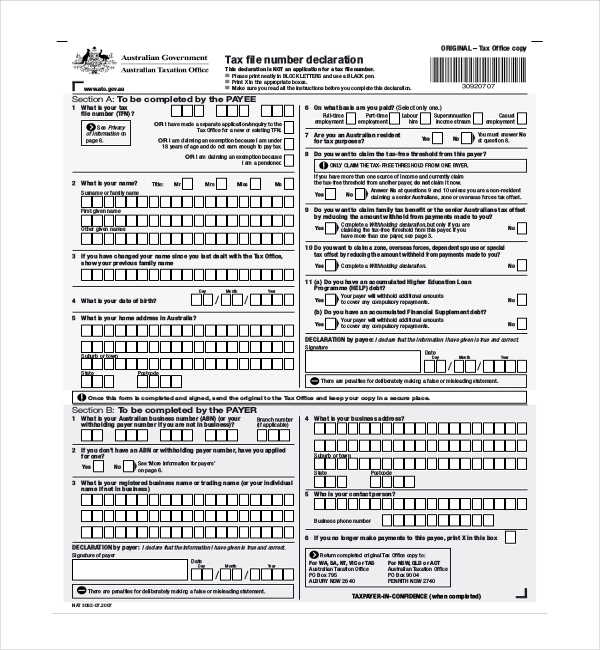 The Australian taxation office presents this form with all the queries that you may have. A proper explanation is given in this form about all the queries that you face. 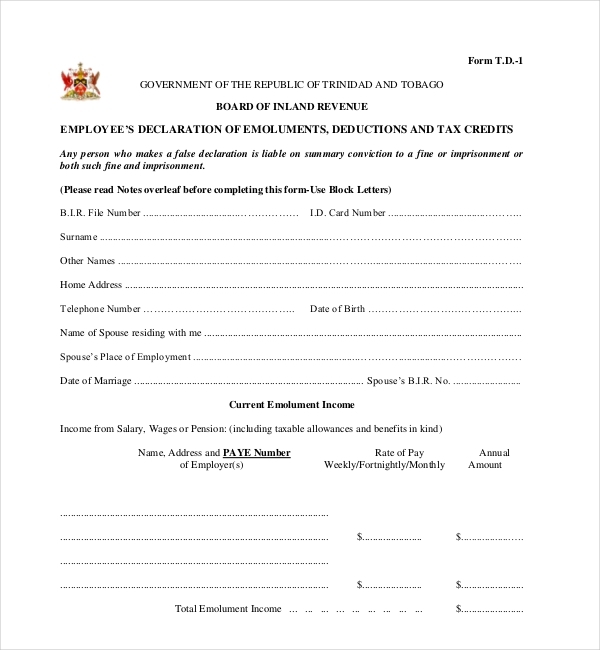 Employee Declaration Form of Emoluments The Government of the Republic of Trinidad and Tobago presents a form for employee’s deduction, tax credits and emoluments. All the information about tax credits and deduction and the employee’s identification must be filled up here. All information should be correct. 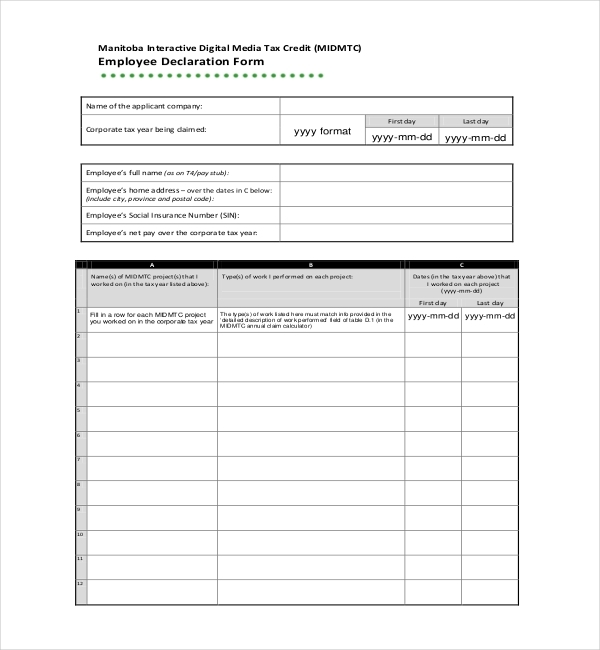 Manitoba Interactive Digital Media Tax Credit form for the employees, need to fill up this form as asked in it. The table has to be filled correctly. These papers are submitted to the MIDMTC Administrators. 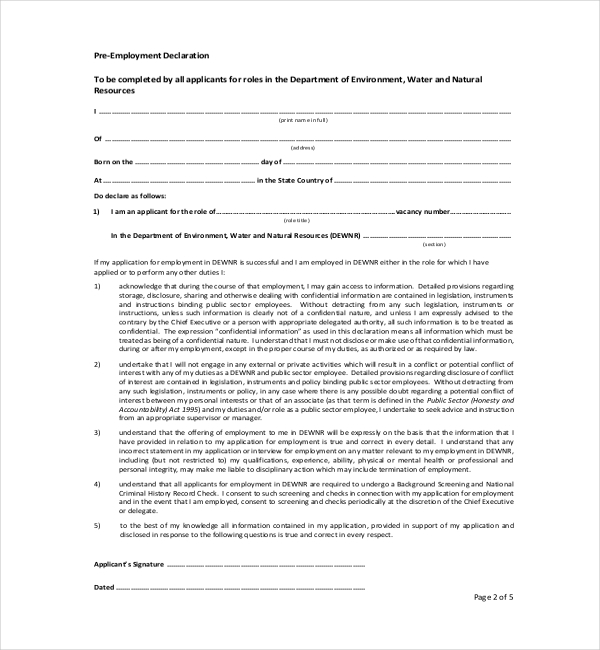 For people who have applied in Department concerned for Environment, Water and Natural Resources (DEWNR) would have to fill up this form. The government of South Australia, DEWNR sees to it for verification and declaration. Incorrect information may lead to rejection of the form or criminal offense. These forms must be filled up on time for further verification. Any question regarding the form must be asked to avoid misinformation. The forms can be used in the court of law to prove either innocence or guilty of the employee. The forms will also help the employee with certain benefits if they require. The income that is subject to tax is created under tax accounting rules, not the financial principles of accounting. An individual is allowed to reduce the taxable income by personal allowances and certain other non-business expenses, which includes local taxes, mortgage interest, state tax, charitable help, medical and other expenditures incurred above the certain percent of income. Federal taxes differ from ten percent to thirty nine percent of taxable income. Local tax and state tax vary widely by jurisdiction. It may be zero to thirteen percent of income. In the year 2013, the top marginal income tax rate for a high income in California resident would be fifty three percent. The forms are to be filled in due time otherwise it would be rejected immediately. These forms are for official purpose, hence one should make sure all the information put in is correct. Any false information will lead to rejection. It may also lead to a criminal offence if ulterior motives are found out. Original documents must be present for verification. Not having documents relating to employee identity or salary proof will lead to rejection of the form. Taxes are imposed on every person, business entities, trusts, estates and other types of organizations. Taxes are based on income, property, transfers, transactions, business, import of goods, and other variety of factors. The taxes are generally enforced on the type of taxpayer for whom the tax base is relevant. Hence, property tax is liable for property owners. Partners are taxed on the income of their partnership. Income tax is put on federal, local and most state levels. Every state may outline taxable income separately. Income tax is the gross income less adjustment and tax deduction that are allowable. Deduction and exemptions- The U.S system permits a decrease in taxable income for both nonbusiness and business expenditure, called deduction. Some varieties of business expenses are deductible over a period of time rather than when incurred. In US, it is a federal crime if a taxpayer is illegally attempting to evade assessment or tax payment imposed by the law. Conviction of such act may lead to fine or imprisonment. Tax evasion is legal but tax avoidance is legal. A federal crime like this may have suitable punishment depending on the level of offence done. Numerous federal agencies have been given the power to conduct investigation like Federal Bureau of Investigation, Internal revenue Service etc. Internal Revenue Service comes under the US law. It is responsible for the administration of Internal Revenue code and collecting taxes. 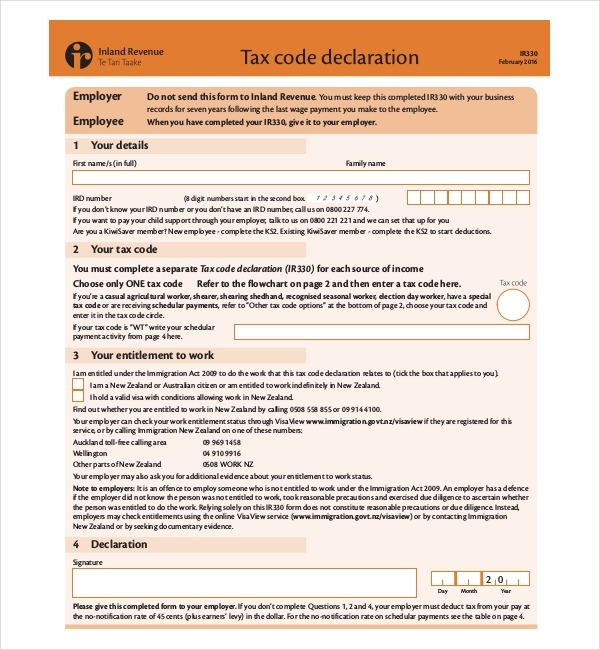 The Employee Declaration Forms is important for all those who are earning annual income under public or private sector companies. It may vary from person to person. Hence, filing such forms would be advisable to know about the gross income and other taxes that are liable in the income. This would help both the government and the taxpayer mutually.